they feel really good and match perfect with my décor. 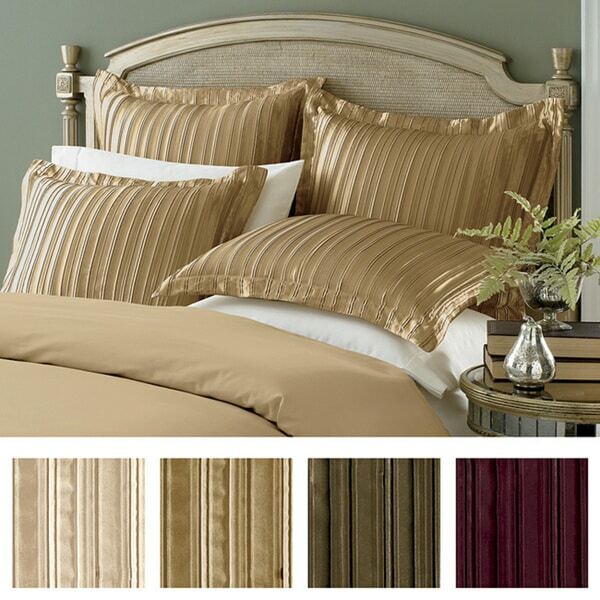 Give your bedroom a touch of luxurious style with this striped satin euro sham. The classic pleated pattern complements a variety of different decor styles, while the rich tones of this sham give your bedroom elegance and sophistication. Perfect for a guest room or spare bedroom, this sham gives any room an air of luxury. Your bedroom gains a sense of classic elegance with this satin sham. The pleated texture gives your bed a rich, palatial feel, which can be the perfect finishing touch. Depending on your bedroom's decor, you can choose the appropriate color in either ivory, gold, purple or mocha to complement your style. Satin pillow sham in ivory was exactly what I expected and looks very nice on my bed. This is a thin satin fabric and I don't think it was meant to be a pillow case. I think if you are looking for a decorative pillow sham to prop against your headboard and make your bedroom look great, then grab these up. Please check the description-Dry Clean only. As for the reviewer who thought they were cheap looking, look at the pictures, they are exactly as they appear. It is a shiny fabric-it says satin. Satin is shiny. Read your descriptions carefully and you will get what you expect. A 20 dollar sham is not going to be the same quality as a 100 dollar sham. I liked the sham and thought it was worth the price. I purchased the 100 percent polyester pleated satin euro sham to match the pleated satin shams and 15 inch drop bed skirts that I had previously purchased. They all look very comfy and beautiful on my master bedroom king size bed! I purchased this sham because I read and watch TV in bed using a Euro size pillow. But it was leaving my hair snarled in the back of my head. Remembering my Mom telling me that a satin pillow case prevents your hair getting snarled when you slept, I purchased this and it works! Affordable, plum color, I'm happy. These are beautiful and less expensive than any that I found anywhere else. I am SO happy with my purchase. I had been lusting after the bedding ensembles at Horchow for months, but sadly I cannot afford to spend 2,000 on a bedding set! This bed skirt was exactly what I was looking for: rich fabric, gorgeous color, and excellent quality. Also, the fabric in the middle that goes under the mattress is the same color as the bed skirt, so I do not have that horrid white sticking out! Beautiful gold color. Wrinkled when they arrived but gone the next day without ironing. Elegant looking in my guest bedroom. well nothing wrong with these-good quality for what they are-seams are fine;soft and cool to touch-LOOK as if they'd hold up well in wash(havn't tried yet).just wish i'd paid more attention and realized only one sham per set.left me one sham short for guests-used my sense of humor to compensate.just wish there were a better selection of euro shams to choose from-allthough these were true to colour advertised-the colour selection was rather murky-and the only other options were some stiff looking black or white poplin shams. I have purchased these several times. They are my "go to" for elegant euro shams. They give a soft layer of sheen without being garish. Love them. These shams are beautiful and fit the pillows perfectly. They are exactly what I was looking for. The detail in the pleats makes them look very elegant. I would recommend them. Worst purchase I have made on Overstock. The shams are a horrible wrinkled mess. They do not keep their shape and just slide off the euro sham. Terrible! I purchased these sheets for my daughter. She said she felt like a princess sleeping on them. They are pretty and very comfortable. I would definitely buy these again. These shams are terrific! I ordered the mocha brown color and they’re even prettier than they appear on the photo. Really nice for the price ! Pretty, good quality shams. They have a nice satiny soft feeling to the touch. In addition, they lasted me a few years with no issues with washing or quality. I needed a nice neutral for European pillows and these are perfect. Elegant with a little bit of shine. Ivory color is actally champagne... gorgeous! Absolutely stunning and luxurious! But... Be aware... The ivory is actually champagne. The most beautiful glossy champagne. I put my Euro Shams on pillows that are were slightly too small so that the silky fabric has a baggy, inviting, Frenchy look. The fabric is lightweight, but not in a cheap flimsy way... More in a flowy way. Stain proof and looks great. This set really sets off my bed looks very nicely. "Do you have sets of two"
"When will the ivory be available again?" Hello Diane S., items are restocked as they become available; however, we cannot guarantee an item will be restocked. Thank you for shopping with us. "When will gold be available again?" Hello trinkles, items are restocked as they become available; however, we cannot guarantee an item will be restocked. Thank you for shopping with us. Good value for style, color, and fabric. "Is this just one sham or a pack of two?" Thanks for your interest in this Striped 100-percent Polyester Pleated Satin Euro Sham, these are sold separately.